The client and her family have the sense of being watched, especially on the staircase of their 30 year old house. The client often feels as if somebody is walking right behind her. When they first bought the house, the client’s mother visited their house for the first time and burst into tears – very uncharacteristic behaviour – due to the “wrong” energy that she could sense and the bad feelings it evoked in her. The client and her children have recently moved out of the house and her husband lives there part time while doing extensive renovations to house. Their children didn’t like the energy in the house either and couldn’t sleep. Their cat lives there full time. When other children would visit the house they would go “ballistic” according to client – she doesn’t understand what it is about the house that makes them do that. The client would see energy as lights swirling in the family room and also in the kitchen window. There is no mundane cause for these lights. The house is built on sandstone/some limestone(?) – has sump hole under floor with pump to remove water seepage. The substrate could contain a lot of quartz, which would amplify the energies in the house. I felt “something” when I walked in – not sure what exactly – just a sensation of something pushing down from the ceiling, but otherwise the first room felt ok. I used my dowsing rods to work out where the gridlines were and didn’t detect anything special. We went upstairs and the smallest bedroom felt very “spinny” inside (my usual reaction to the presence of something paranormal). The others noticed something wasn’t right in there too. I checked the gridlines – again, nothing special. The bedrooms at either end felt more or less ok. There were no orbs in my upstairs bedroom photos. I took some photos from the top of the balcony into the midlevel downstairs loungeroom. 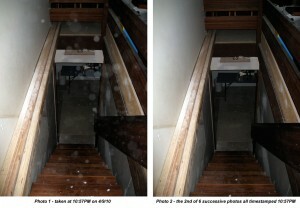 Consecutive photos showed lots of orbs, then nothing, then more orbs. Heather photographed orbs also. She and Wayne both saw them on her camera screen actually coming towards them. Her photo showed streaks and traces of movement. I went to the mid level again, then was about to head down stairs to bottom level and decided to take photographs at the top of the stairs. 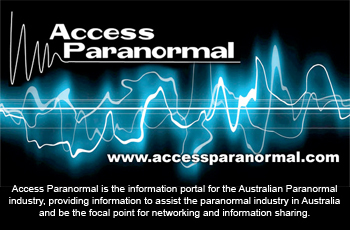 The first photo showed lots of orbs, then the next 5 photos showed none. The dust didn’t seem to behave like normal dust – could have been heavier plaster dust but not sure. 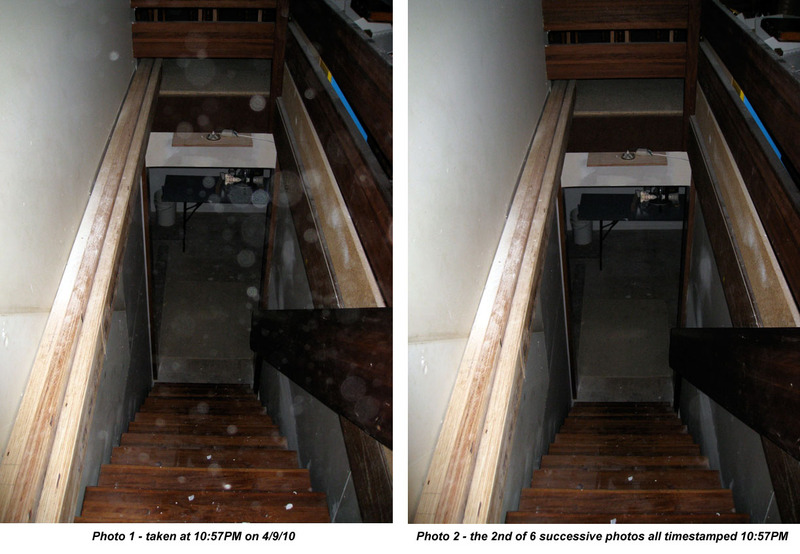 The orbs in the photo are most likely dust although the client did say that downstairs was where the most paranormal activity was – she and other family members had a constant sense of being watched and of somebody following behind them on the staircase. Part of downstairs had previously been a self contained ‘granny flat’ where the mother of the previous owner had lived with the family. The current owners were renovating and had removed the kitchen and some walls. The small bedroom there felt “putrid” according to Janine – I went in and felt very lightheaded and dizzy or spinny – it didn’t feel good at all. I got an impression of a female presence – she had short dark curly hair, was overweight, short and big breasted. I also got the sense of her being maybe Greek, Italian or central European in appearance. The current owner confirmed that the previous owner looked just like that, so her mother would have looked similar. Janine got the same impression of her appearance as did Heather. Janine thought she saw her a couple of times flitting past doorways downstairs – wearing a striped top with very wide red and white stripes – 1980s style(?). According to the client the previous owners were not nice people as they had purposely concealed massive termite damage to the house when they sold it to the client. Their negative energies are still hanging around and the house needs to be cleansed. We will go back next Tuesday night and cleanse with sage, bells etc and send the grounded spirit over. The cat was very friendly when we arrived, rubbing our legs and purring. Gabriel did a walk through and picked up on many of the same things as we did on the Saturday night. The downstairs room still felt spinny to me and oppressive with a feeling that the ceiling was pressing down. Gabriel sensed the vortex there which confirmed our earlier feelings from the first visit. He saw the woman as being much younger with long dark brown wavy hair. We had purposely not told him what we had felt on the first visit. He also felt a spirit touch him on the back of his neck. We set up our space then unpacked the Ouija board and did a séance with the video camera running. The planchette moved very erratically as if the spirit was in a panic or very distraught, moving across the board quickly as if trying to spell out something but not sure how. Janine felt the spirit was standing beside her right shoulder. The spirit said she was lost and couldn’t find her family. She’d died, come back to her house and they were gone as they’d sold the house. She didn’t want to cross over as she was afraid – she said she was Catholic. She said she had cancer but died as a result of or after an operation which she said was stuffed. I think she said she was born overseas(?) in Europe(?) and was 68 or 69 and her husband was 87(eighty something?). The spirit said she trusted us and would allow us to help her by calling on her ancestors and loved ones in the spirit world to come to her and take her across with them. Then we closed the vortex in the downstairs room (which extended up through the top levels of the house), cleansed the house with sage, bell ringing and spray mist of water, lavender and salt. We projected energy to clear the place and I also put up protective energy barriers. We closed down the vortex we detected upstairs in the family room. It was right in the same area where the client sometimes saw swirling energy lights in the room. Another was in the kitchen where there was a large mirror hanging on the other side of the wall in the dining room. We closed that vortex down also. The cat was sitting in the loungeroom watching me and as soon as I projected energy closer to where he was he bolted out of the room. The cat was very wary of us afterward and wouldn’t come near any of us, whereas before he had been rubbing himself on all of us and purring. We eventually got him to calm down and trust us again and he rubbed himself on Janine and wanted to be patted and he then came to me and allowed me to stroke his back again. The cat’s behaviour was proof that we’d brought about an energy shift. The client was very grateful for our help and thought the house felt much better after our second visit. You were a big help to my sister, (name) of Kareela. It was funny to hear about the lady who was still downstairs. I knew she was there, she spent a lot of time in the rocking chair. Can’t believe I lived down there with her for so long!